Captain America and Wolverine arrive in their Mega Morphs to back up Spider-Man and Ghost Rider, but Hulk and Doctor Octopus are long gone. The quartet still manage to destroy the giant Doombots, which of course Doctor Doom denies sending. Based on where Hulk’s tracking device went down Nick Fury realizes where the two are headed…the holding facility for Red Ronin! You know, this guy. That would be the robot in red on the left. Yes, Godzilla is still canon in the Marvel Universe. 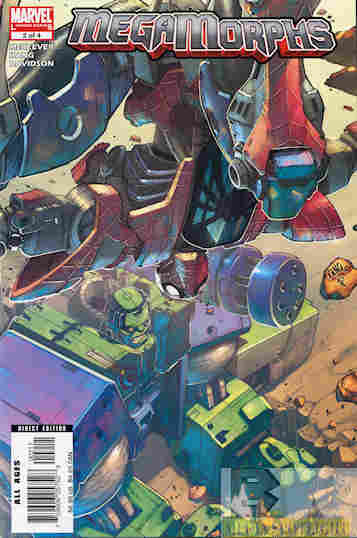 What they got right: Good giant robot action, ties to relatively obscure Marvel lore, and a pop shot on how many teams Wolverine was on at the time. Plus Spidey’s one-liner fetish isn’t as bad as it was last issue. I think they just like using Spidey to write snark. 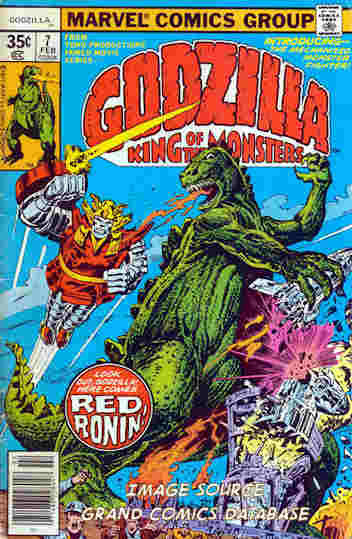 What they got wrong: Red Ronin was built in the 1970s or whenever Godzilla took place currently in the sliding timeline. Compared to the Mega Morphs it has to be obsolete, and once piloted by a 12-year-old Godzilla fanboy so I’m not seeing the attraction considering what Doctor Octopus, and one would assume his benefactor, already have at their disposal. It’s nice to see Red Ronin again but I don’t see the point. Recommendation: An enjoyable story thus far. Might be worth checking out. I’ll know for sure over the next two weeks. Posted by ShadowWing Tronix on June 20, 2018 in Marvel Spotlight, Yesterday's Comics and tagged Captain America, Doctor Doom, Doctor Octopus, Ghost Rider, Hulk, Mega Morphs, Spider-Man, Steve Rogers, Tony Stark, Wolverine.